Judy Westlake is a USDF Gold, Silver and Bronze medal rider and United States Dressage Federation (USDF) certified instructor. 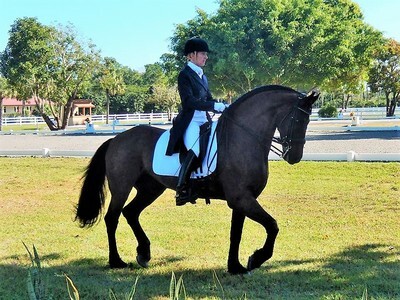 Judy's passion to learn has led to a degree in Animal Sciences from The University of Rhode Island and Olympic level dressage instruction from world-renown dressage trainers. 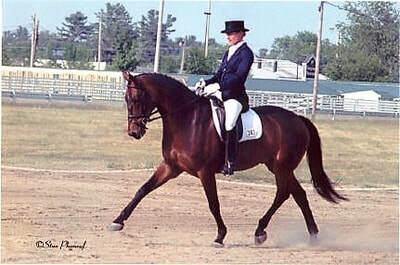 Upon graduating from the University of Rhode Island with a Bachelor's degree in Animal Science, Judy was employed by Johnson and Wales University as an instructor in their Equine Studies Department where she taught riding as well as giving regular lectures in various equine-related topics. A wonderful opportunity to lease a barn in New Hampshire became available and she established Windcroft Stables in Madison, NH, Her business grew into a thriving lesson and training facility with an emphasis on eventing and dressage. It was during this time that Judy met Sue Blinks, one of the nation’s top dressage riders at the time. 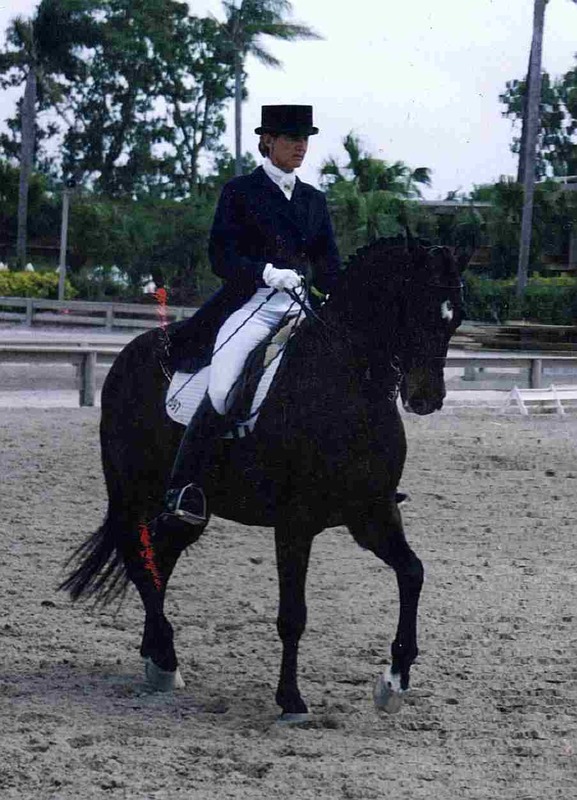 Sue earned medals at the Olympic Games and FEI World Equestrian Games and through Sue Blinks' education and mentorship, Judy acquired her enduring love of dressage. Sue helped Judy find two foundation dressage warmbloods, Iggy and Livian, which Judy went on to successfully train to Prix St George and Grand Prix. The first of many horses she would take to FEI. 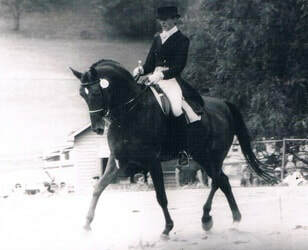 In 1991, Judy established Broad Park Equestrian Center in Gray, Maine. Broad Park was successfully owned, designed and built by Judy to be a full-service board and training facility on 20 acres and housing 28 horses. During this time, she become a United States Dressage Federation (USDF) Certified Instructor earning her USDF Bronze, Silver and Gold Medals. She credits the foundation knowledge contained in the USDF Certification curriculum, along with exceptional mentoring from Major Anders Lindgren for giving her the next level of training knowledge needed to produce top horses and riders. This is where she was first introduced to Long Lining and working horses in hand. and teaching to her students. The FEI Winning Begins ! Her next grand prix dressage horse was sponsored by a dedicated group of her students. Judy competed Lyric at Grand Prix and earned her USDF Gold Medal and also endeavored to qualify for the 2000 Olympic Games. With the help of Gunnar Ostergaard, Judy and Iggy were able to win the USDF Regional Prix St George Championships and the USDF Regional Intermediare 2 Championships. As well as many local and regional wins. They were also chosen to be Demos at Intermediare 1 for the Reiner Klimke Symposium in Maryland. Judy and Iggy continued on to Grand Prix. after a success run at that level, Iggy became a schoolmaster for an FEI Young Rider and also helped other Students of Judy's earn their Silver Medals. 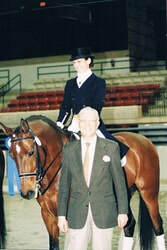 Judy continued to develop horses and riders with great success. An opportunity with work with The Spanish Riding School master, Karl Mikolka, expanded her training and teaching knowledge to another level. His timing and gymnastic exercises revolutionized Judy's teaching and training. With his help, she developed more FEI horses and students. Judy's long time student Barbara West earned her USDF Gold Medal on her horse, Cannonball, that Judy trained to Grand Prix. She also brought along sales horses, including Delamere, who with Judy, was high score at 2nd and 3rd level for the GMHA and UNH competitions. And she had a wonderful opportunity to show Daniel DG Prix St George in White Fences. In 2002, Judy met Eckart Meyners, Kinesiologist PHD from Lunenburg, Germany through Jill Hassler Scoop. Eckart's work in coaching the rider to improve their position and coordination through Kinesthetic exercises was a huge influence in Judy's work and instruction. She studied with Eckart and traveled to Germany to work with Hannes Muller at The German Riding School. The "Balimo" System that Eckart developed has become an integral part of the training of Germany's riders. The Infinity Farm crew, where Judy teaches regular clinics, collecting their year end awards from MDS, Congratulations to all! Also check out Judy's Clinic Schedule for the next time she is in your area. 2014 saw another big change for Judy. She had established a growing clinic clientele in California for many years and was offered an opportunity by The J.F. Shea Theraputic Riding Center to become their "in house" clinician. This has given Judy the ability to have a beautiful facility to consistently develop students and train horses in Southern California. 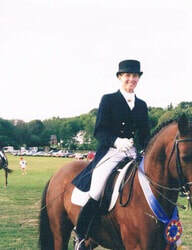 Her very successful Westlake Dressage clientele can be followed in her Latest News Page and on Facebook. Judy continues to fly east now, keeping her east coast contingent happy with monthly clinics.